Hello…It’s a humid and slightly overcast Sunday here, but hopefully we’ll see some nice sunshine later today. 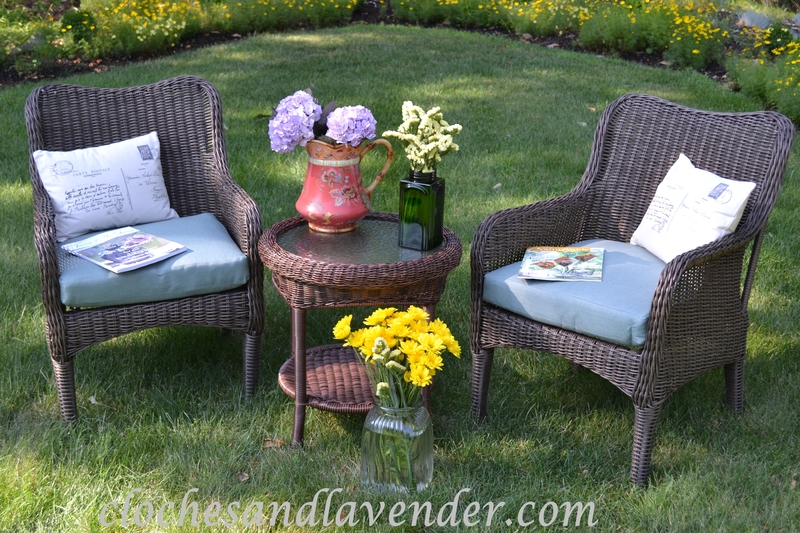 Yesterday was a bright and sunny morning and since I had flowers from the market and more from my garden, I decided to put them next to these chairs out in the yard in some of my pitchers and things. 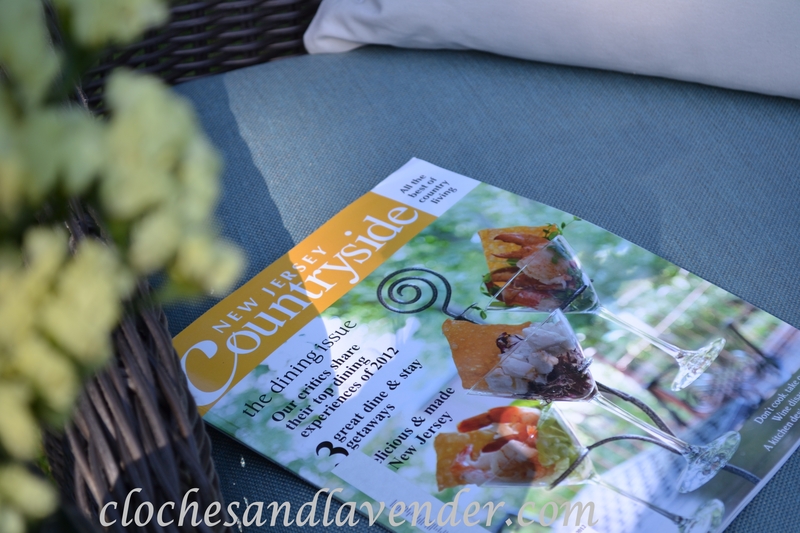 John and I sat out there while I read my favorite magazines, before it got to hot. 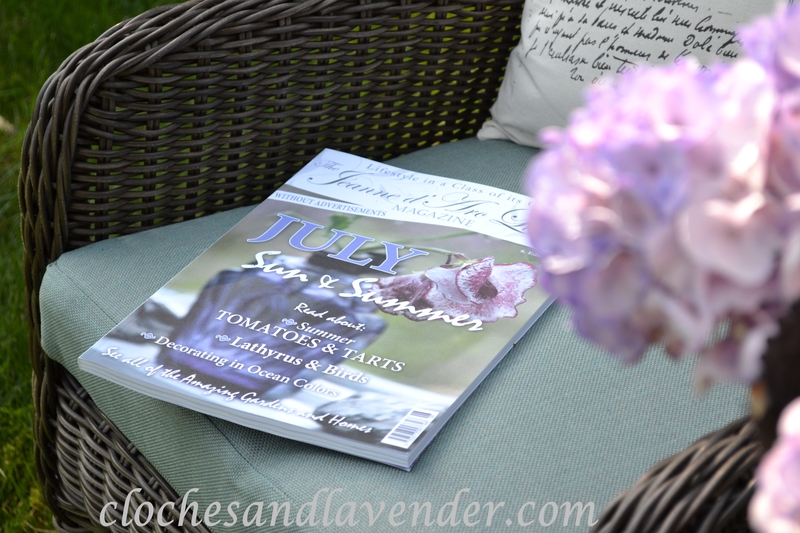 When I was finished; I thought why not take a picture of my impromptu reading area and show you how I relax in the yard sometimes along with a few of my favorite magazines. I hope you enjoy the scene. Cute space! You must have been out very early to beat the heat / humidity! We go out very early we have two puppies so we are up early. That is the only time I can got out I have Multiple Sclerosis and itis tolerable for me since the heat makes me feel sick. we have a similar spot under a big old maple tree that we start and finish our days out there – it’s the coolest spot in the yard. Thanks for sharing. Thank you for looking and taking the time leave a coment. 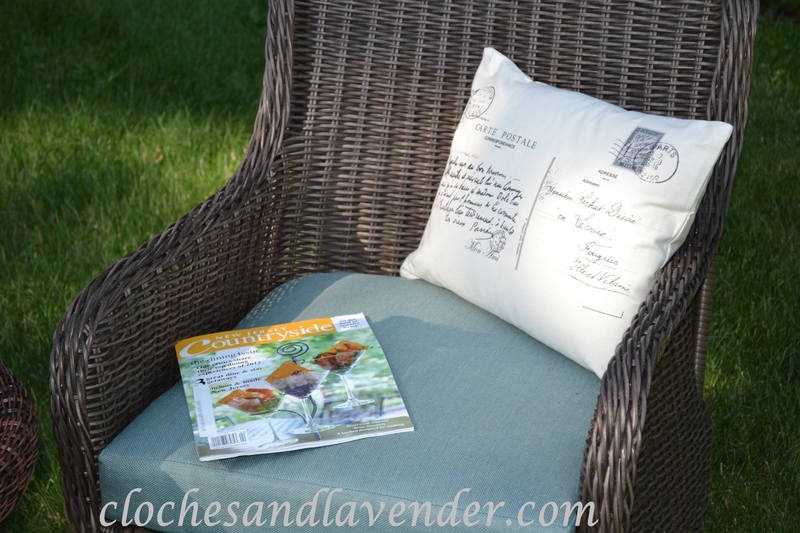 You have a lovely spot for relaxing and reading your magazines. I have a similar spot just it’s just been too hot and humid for me out there so haven’t really enjoyed it this summer. That is why we got out there very early or very late in the afternoon. Today would be out is it just too humid. I love your lavender wicker chairs. They look so pretty with the blue cushions. 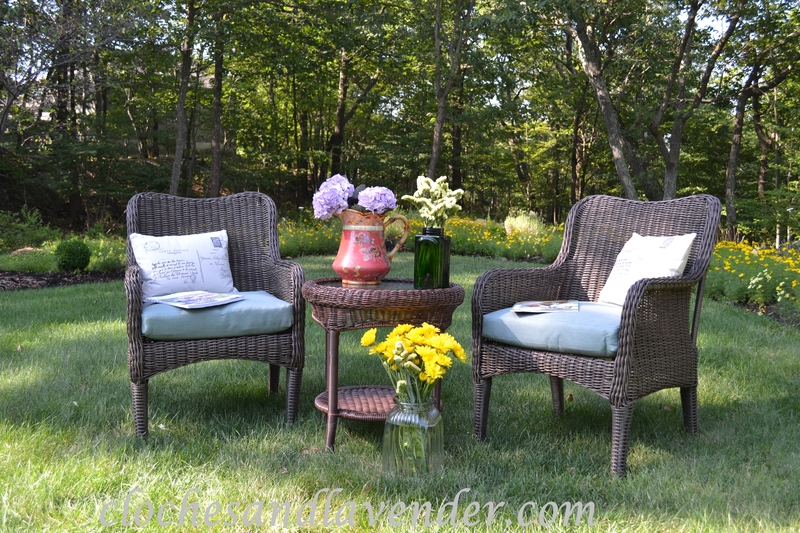 Thank you I love our brown wicker chairs we just got them this year. What a fabulous reading area….love those chairs! I wish our grass were that green….ours is a very unpretty shade of brown. Such a lovely reading area! 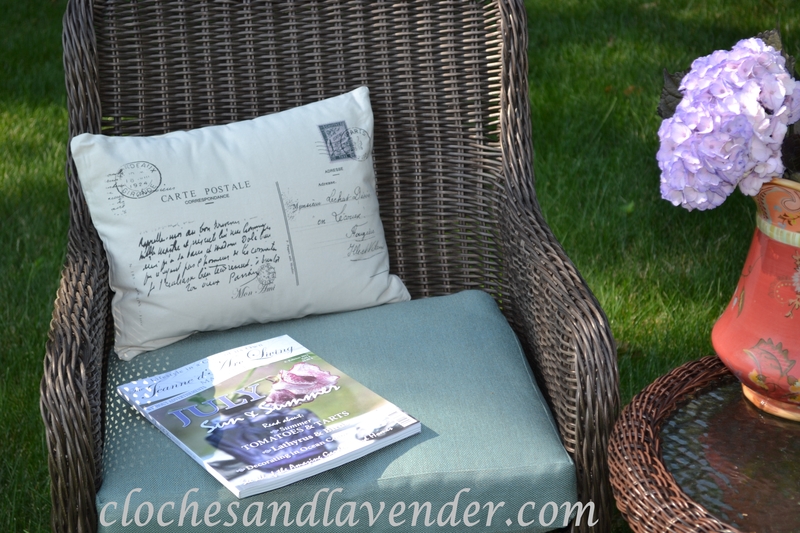 I adore your post card pillows! Thank you very much. I love those pillows. That looks like a very happy place! Absolutely perf3ct! I love your reading spot…looks so inviting. Looks so peaceful and relaxing! 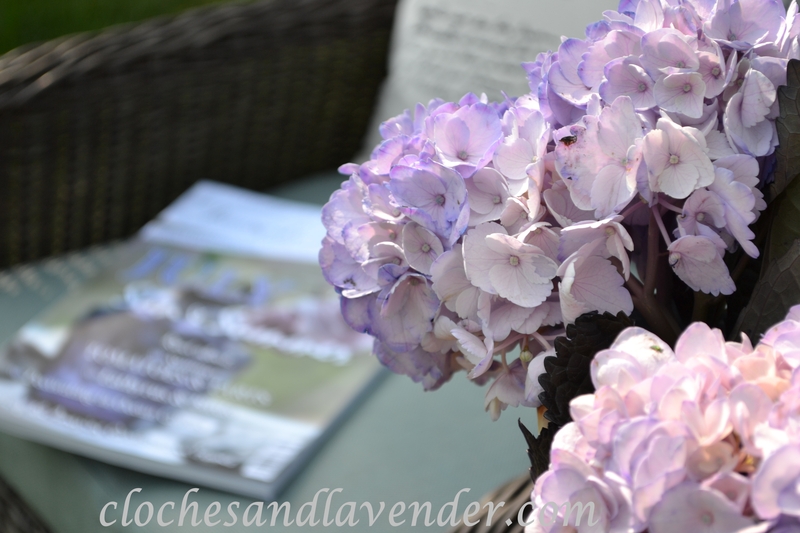 There’s nothing better than being able to sit out and enjoy your own yard and gardens! Thanks. It has been a challange with the hreat and humidity. I have to plan my moments. Understand that. We do coffee on the patio at like 6:30 in the morning and it is the perfect weather. Then, the heat sets in! hank you so very much! What a beautiful space to relax and read a book or magazine! Beautiful pictures! 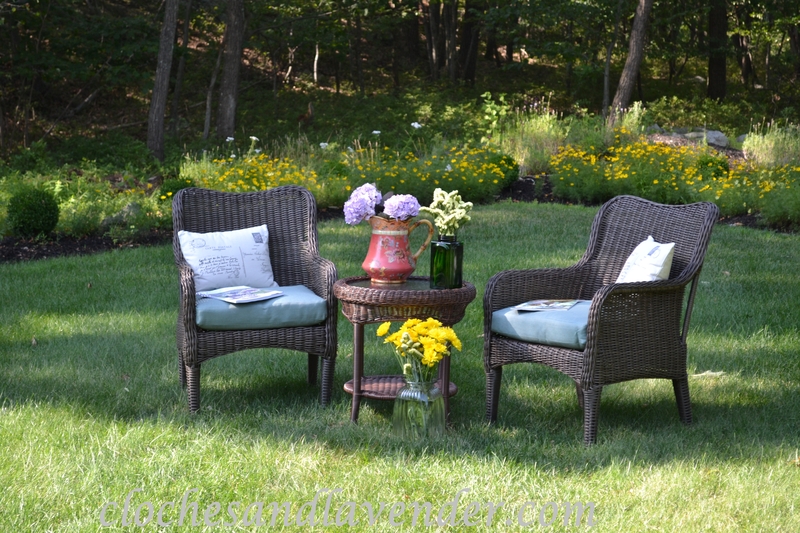 Love your outdoor space! What a great place to relax and just get lost in all it’s surrounding beauty! Thank you so much for linking up to One More Time! Ohh….can I come over for some tea? I love your set up and the pillows are stinkin’ cute! Thanks for sharing your wonderful reading area on Simple & Sweet Fridays. What a beautiful space you have created in your garden! Thanks for hosting. It rained here a lot the other day and today it is beautiful but scattered showers the rest of the week.